"Growing Bolder is a wrecking ball of truth and inspiration. Marc’s mission to rebrand aging represents a desperately needed paradigm shift." We are aged less by our years and more by our beliefs. All presentations are modified and tailored to best suit each individual event and client needs. If uncertain about which presentation you prefer, Marc’s signature presentation, Growing Bolder: Defy the Cult of Youth, Live With Passion and Purpose combines elements of all presentations. It’s the go-to presentation and modeled after his new book. 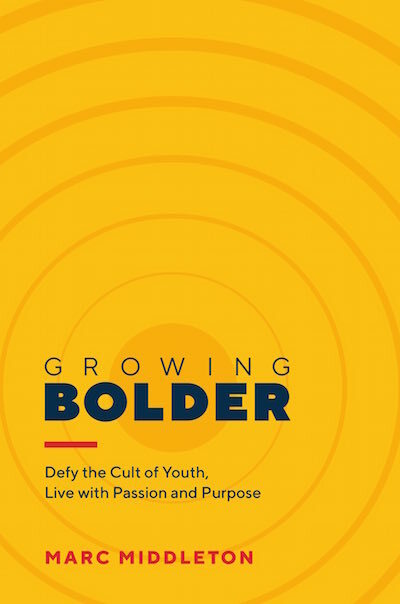 Growing Bolder: Defy the Cult of Youth. Live With Passion and Purpose. Growing Bolder’s Launchpad to What’s Next: The art of the comeback. Reaching the Purchasing Powerhouses: Connecting with the most important and powerful consumer in America. The Science of Growing Bolder: An evidence based playbook for active longevity. The Explosion in Masters Sports: What we can from the world’s most active seniors.